As is routine in Armenian American politics, an Armenian Genocide resolution was introduced in the US House of Representatives at the beginning of the 114th Congress. Once again leading the charge are Reps. Robert Dold (R-IL), Adam Schiff (D-CA), David Valadao (R-CA), and Frank Pallone, Jr. (D-NJ). Together, they introduced H. Res. 154, aka the Armenian Genocide Truth and Justice Resolution, on March 18, 2015. This bill differs significantly from the bipartisan Armenian Genocide recognition resolution which passed committee in 2000, 2005, 2007, and 2010. As of this writing, H. Res. 154 boasts 62 cosponsors and has been referred to the House Foreign Affairs Committee. Given the significance of 2015, the Turkish government ramped up its denial campaign in the United States and sought to introduce an opposing bill in Congress. In the weeks after the introduction of H. Res. 154, Rep. Curt Clawson (R-FL) circulated a letter to his House colleagues asking them to support a different resolution. Clawson’s bill, which planned to use language proposed by the newly-formed Turkish Institute for Progress (TIP), would use text from H. Res. 154, strike reference to the Armenian Genocide, and create a 100-year congressional task force aimed at bringing the Turkish and Armenian people together. 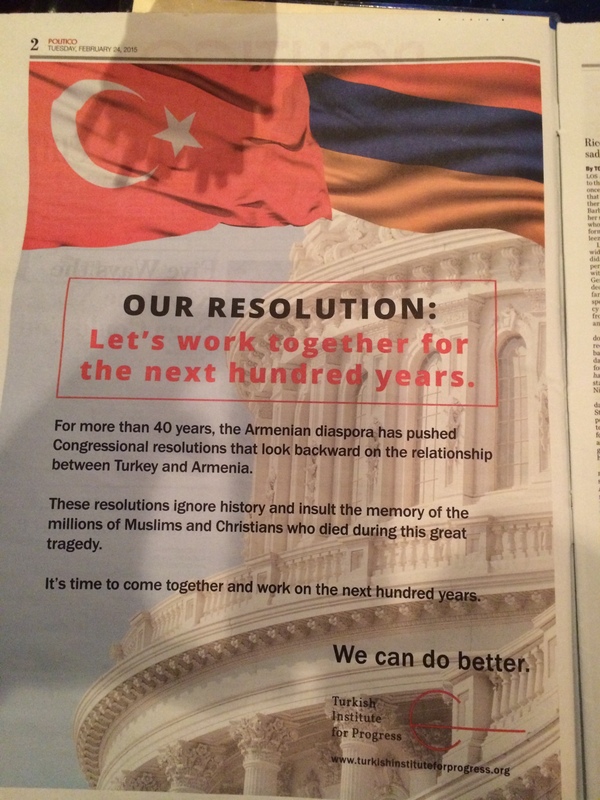 “Unite us, not divide us,” a reference to the full-page advertisements that ran in The Washington Post and POLITICO, is political speak for Turkey’s latest genocide denial lobbying campaign. Then, on April 28, 2015, H. Res. 226, a resolution calling on the President “to work toward equitable, constructive, stable, and durable Armenian-Turkish relations,” was introduced by Pete Sessions (R-TX). Sessions’ bill not only omitted reference to the Armenian Genocide, it also left out the Turkish proposal for a joint taskforce. Pete Sessions is the Chairman of the House Rules Committee, which is commonly referred to as the “Speaker’s Committee.” H. Res. 226 currently has 2 cosponsors. Clawson has yet to introduce his Turkish denial resolution. For House Republican leadership this scenario played right into their hands. John Boehner has voiced his objection to a congressional resolution acknowledging the Armenian Genocide on more than one occasion and Rep. Clawson was one of 25 congressmen to vote against Boehner for the Speakership. 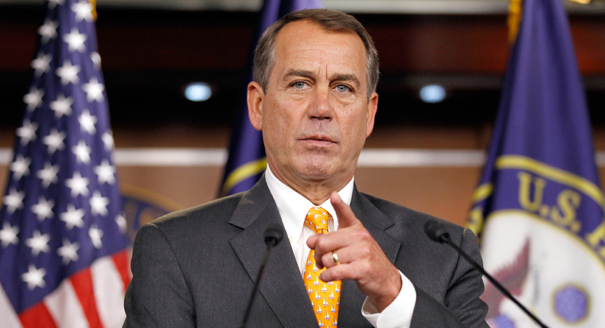 What Speaker John Boehner has effectively done is introduce a bill, stripping the specific language for which each opposing lobby group was advocating, rendering the issue legislatively moot, and check his Tea Party foes in the process.